This is my younger daughter’s bedroom. It’s hard to believe, but today my daughter, my middle child will be turning eleven. You may remember that when my oldest turned eleven, we gave her bedroom a whole new look…it was even featured in a national magazine! A hard act to follow and now the time is here. Even though my daughter and I have been all over pinterest for months looking for some inspiration for her room, we really can’t find anything that we both agree on. 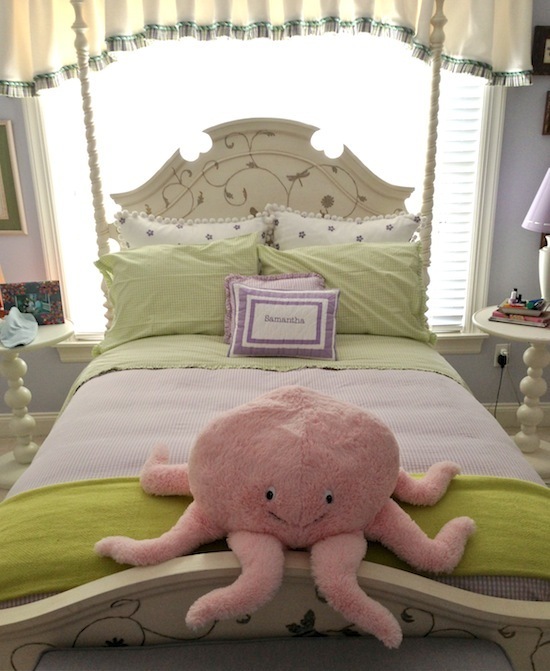 When I re-did my older daughter’s room, finding that initial inspiration was key. The room practically designed itself after we had the visual we needed. This time around, it’s more of a challenge. The room is smaller with windows on one side and closets taking up another wall. So far, all we know for sure is that we’ll be keeping the color scheme of lavender and green. Here are a few more thoughts on possible purchases and another perspective of the room. Do you have a girl’s room pinterest board we should follow? Any feedback at all is more than welcome! we are trying to finish up my 3 year old's room and it's not my favorite activity, to be honest. i'm so not good at it but have been consulting with a designer. love how we went with a pretty purple with a deeper stripe about 5 feet up. It adds nice dimension without going around. We're about to repaint an old bookshelf in the same color to add some interest and are creating a little reading nook (3-year old appropriate!). Good luck… love your inspiration so far. Very pretty…love the colors, so sweet! Isn't Pinterest amazing for inspiration and ideas!! Well knowing your past designs I'm positive this room will turn out amazingly beautiful…I love what you have identified so far and can't wait to see it all come together. I remember my mom involving me to redecorate my room when I was younger and loved the process. We need to also redecorate my daughter's in about a year…..and she has told me she wants zebras involved!! i have a question/comment. 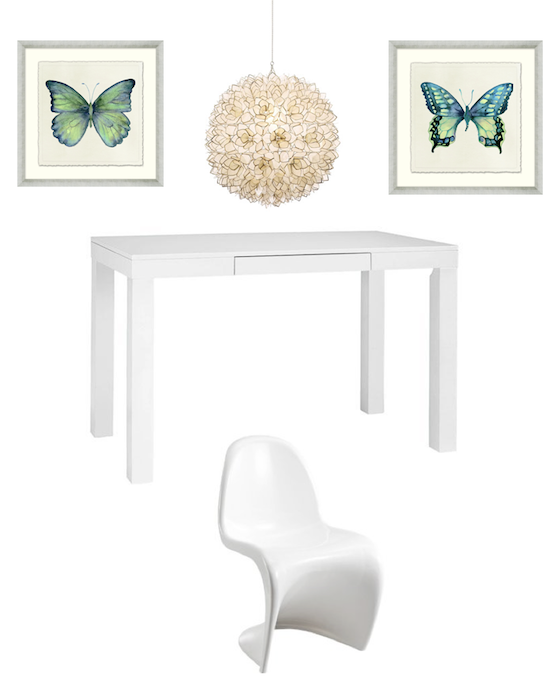 While I love the parsons table for a desk, (I too am considering it for my kid's redesign), I wonder what to do about storage…do you have any ideas? We're thinking about under the bed storage bins if we go the Parsons desk route…good question;) thanks! This is always a hard project, especially for Mom! Love her color scheme and some of the items you purchased. Hard to offer any advice without being in the room but I might consider a cute window seat and move the bed to the desk wall if space allows. Looking forward to seeing the final result. Oh, you poor thing! When we asked our boys to give us some direction with their new bedrooms, they just rolled their eyes and said do whatever you like. Sometimes, we think that's even harder… We know your daughter's room will come out beautifully – hang in there! 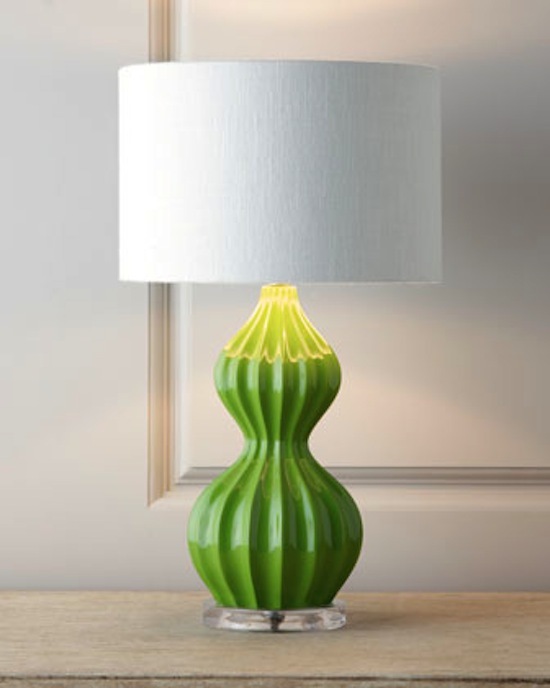 Love the green lamps and sounds like you've got the color scheme….so that's a great start. Check out Sam Allen…he has done cool kids rooms. Maybe different colors, but you could get some basic ideas.